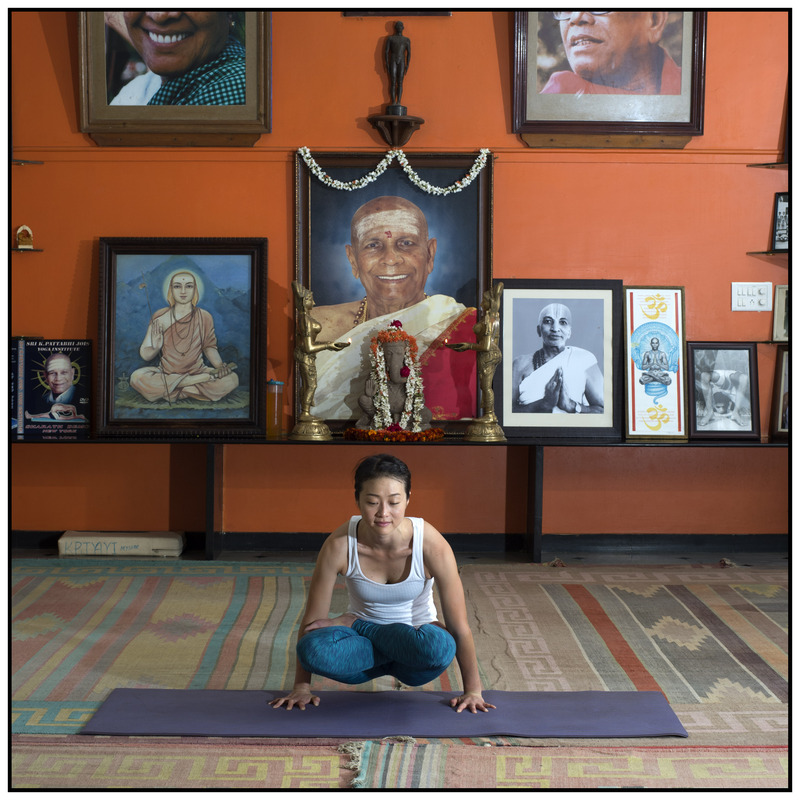 The home of Ashtanga Vinyasa is Mysore, India. The practice is often referred to as ‘Mysore style’ because of the way it is taught – as a self-practice (silent, yet guided by a teacher through adjustments and minimal verbal cues), or, with led ‘counted’ classes once a week, for the student to learn the vinyasa count, correct breathing and keep track of the pace. ‘Open level’ or ‘led classes’, which we find in most studios, gyms, and wellness centers around the world are a far cry from the authentic practice of Ashtanga yoga. However, they follow the same sequence and guidelines and make the practice accessible (and often easier) for beginners to follow. Click here to read our blog Ashtanga Yoga Mysore Style – an introduction. So as Ashtanga developed in a traditional way, the father of the practice, Sri K Pattabhi Jois, started by sharing his yoga with westerners in the late 70s and 80s. When more students came and wished to share his yoga abroad, he was encouraged to devise a system of qualification that allowed some students to teach. At the very beginning the rules may have been more fluid, where the ability to teach and be granted a certificate was partly determined by one’s (physical) ability in the asana practice, commitment to it, dedication to the guru and there was possibly some level of favoritism from the master himself, Pattabhi Jois. As more westerners began teaching and traveling to Mysore, the qualification system was laid out in a more thorough fashion. To begin with, one should have been to Mysore at least three times (and practiced with Guruji) to be authorised. However, no student should ever go expecting to receive that piece of paper, nor should one ever ask. Traditionally, the teacher would just be appointed by Guruji to teach. During the earlier days, it was Guruji Pattabhi Jois and nowadays it is Guruji Sharath Jois. None of the other Teacher Training Courses offered somewhere outside the mother institute in Mysore have the same level of qualification – they may offer a Yoga Alliance branded certificate, but to be ‘officially’ authorised by the Institute requires one to have spent time with Sharath Jois. Sharath Jois, the current lineage holder, dismisses all the other Ashtanga teacher training as invalid and points out they are simply a money making business. Only the KPJAYI can deliver the official certificate that allows one to share the practice. Click here to read about the 10 benefits of practicing Ashtanga Yoga Mysore Style. As with all systems, there are rules to follow as a teacher (such as running a daily Mysore program, observing moon days, following the sequence strictly etc) and if those rules are broken, one may be taken off the official teachers’ list. So all in all, the Ashtanga authorisation system is traditional, rooted deep in Indian traditions (following the guru, spending time studying with him and learning about the philosophy behind the practice). It is not something one can buy and deliver in a month. There is also a strong support network within the Ashtanga community, that comes for free. It is a fluid, global connection between teachers and Shalas, sharing the same practice. That is invaluable. Normally, an Authorisation takes a minimum 3 to 5 visits to Mysore and the duration could be more than a month each. A Certification requires at least 11 visits plus a certain level of practice – usually full advanced A series and knowledge of some scriptures. Level 1 Authorisation – means the teacher can only teach primary series. Level 2 Authorisation – means the teacher can teach full intermediate series. Certification – means the teacher can teach postures of the Advanced A Series and sometimes beyond.